The quality IN / Out boards allow you to instantly monitor which staff members are on site for health and safety purposes with these In/Out boards you can simply removed them from the wall and carry them to an assembly points in the event of an emergency. Indicates which staff are on and off site. 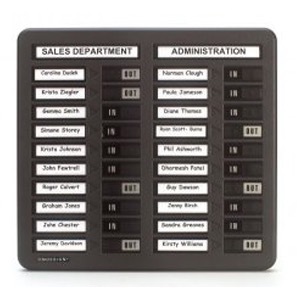 Card inserts to show staff names, supplied in a strip so they may be typed or labelled. Simple to use slide and click mechanism shows IN or OUT. 3 sizes of panel available which can be mounted side-by-side for increased name capacity. Attractive and robust, this board is ideal for any environments. Frame may be cleaned without damage to the finish. Supplied complete with wall fixing kit including wall plugs. The 20 name size board is 360mm (H) x 382mm (W).